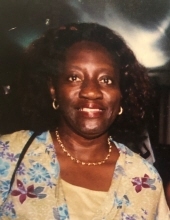 Delores Coney of Gainesville passed away December 4, 2018. She's a 1971 graduate of Gainesville High School and member of Greater Bell United Methodist Church, Brooker, FL. She served on the United Methodist Women Group, Chancellor Choir, Praise Team and other Boards at the Church. She retired from ExacTech. Preceded in death by her parents, James Coney Sr. and Leila Mae Hill; grandmothers, Viola Coney and Alberta Hill; brother, James Coney Jr.; and favorite aunt, Ardella Roberts. Survived by her son, Andrew A. Banks Jr.; a granddaughter, Anjelah Amara Banks; aunt/like a sister, Deborah Hill Sledge (Michael Hill); niece, Tanekka Archie (Greg); cousins raised as siblings, Suzette Williams (Thomas), Lorenzo Hill Jr. (Helen), Gary Hill, Jessie Levern Hill; like a daughter, Jocelyn Banks; special cousins, Yvonne Ross and Viola Fleming; aunts, Willene griffin, Josephine Hill; God daughter, Aquinetta Franklin; special uncle, Charles Sledge; and a host of other relatives and friends. To send flowers or a remembrance gift to the family of Delores Coney, please visit our Tribute Store. "Email Address" would like to share the life celebration of Delores Coney. Click on the "link" to go to share a favorite memory or leave a condolence message for the family.